r.mblend - Blends two rasters of different spatial resolution. 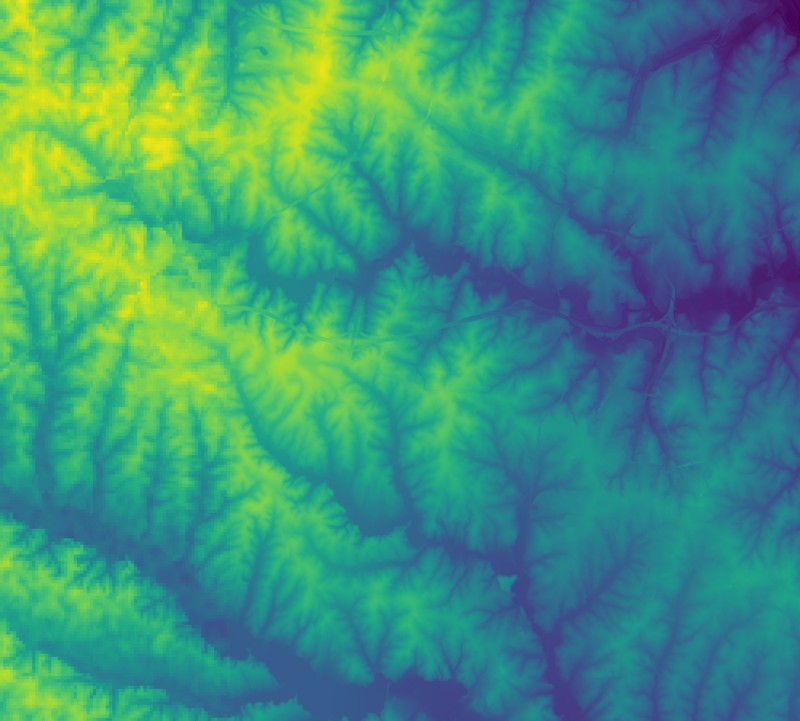 Assign the average difference between the two rasters to the far edge (instead of zero). Percentage of distance to high resolution raster used to determine far edge. Number between 0 and 100. Number of points to use in interpolation. A higher number produces a smoother result but requires a lengthier computation. This module implements Mblend, a DEM merging method proposed by Leitão et al. (2016). It deals with cases where a study area is only partially covered by a high resolution DEM, with a coarser DEM available for the remainder (as in the case shown below). r.mblend merges the two DEMs, producing a smooth transition from the high resolution DEM to the low resolution DEM. 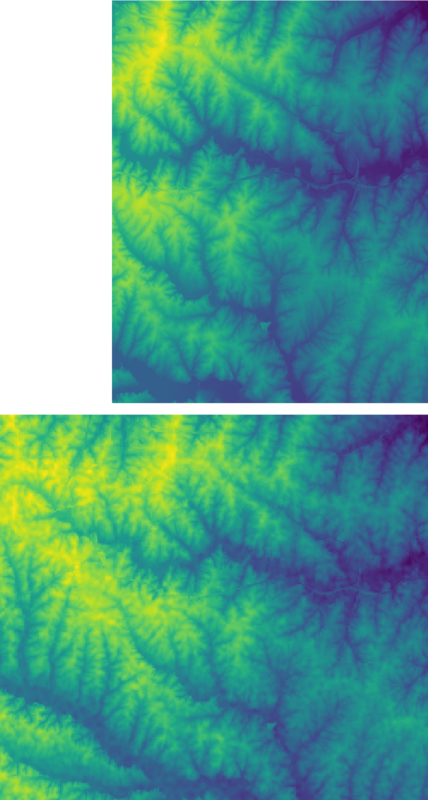 The module works by identifying the edge between the two rasters (near edge, shown in read below) and the edge composed by the cells in the low resolution DEM farther away from the high resolution raster (far edge, shown in blue below). To each point along the near edge is assigned the difference between the two DEMs. To each point in the far edge is assigned the value 0. The Inverse Distance Weighted (IDW) method is then used to interpolate a new raster with the points along the two edges. This differences raster thus trends from the full difference at the near edge towards zero at the far edge. The differences raster is finally added to the low resolution DEM given as input. 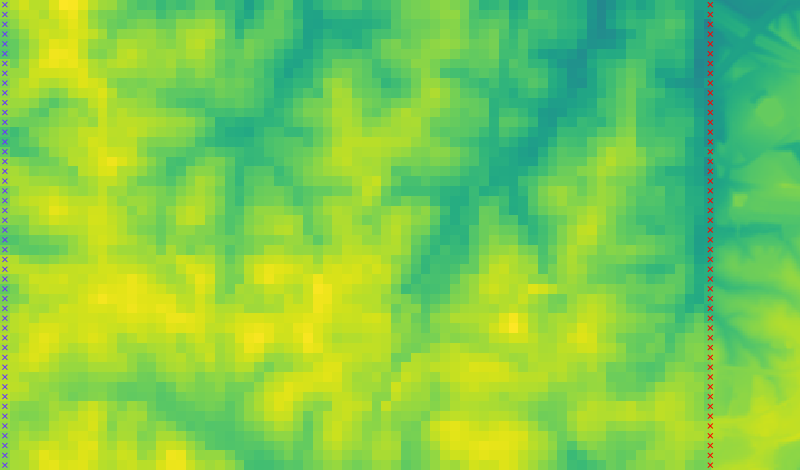 In the resulting DEM, cells along the near edge take the values in the high resolution raster. The farther away from the near edge (and closer to to the far edge) the closer is their value is to the low resolution raster, producing a smooth transition, without artefacts. J.P. Leitão, L.M. de Sousa, Towards the optimal fusion of high-resolution Digital Elevation Models for detailed urban flood assessment, Journal of Hydrology, Volume 561, June 2018, Pages 651-661, DOI: 10.1016/j.jhydrol.2018.04.043. L.M. de Sousa, J.P. Leitão, Improvements to DEM Merging with r.mblend. In Proceedings of the 4th International Conference on Geographical Information Systems Theory, Applications and Management - Volume 1: GISTAM, March 2018, pages 42-49. ISBN 978-989-758-294-3 DOI: 10.5220/0006672500420049. J.P. Leitão, D. Prodanovic, C. Maksimovic, Improving merge methods for grid-based digital elevation models, Computers & Geosciences, Volume 88, March 2016, Pages 115-131, ISSN 0098-3004, DOI: 10.1016/j.cageo.2016.01.001. To report bugs, propose new features or discuss the funcioning of this add-on, visit the project repository at GitHub. EAWAG: Swiss Federal Institute of Aquatic Science and Technology.